An elderly patient with steroid and oxygen dependent COPD, and NYHA Class IV CHF, presents with dyspnea. The patient is alert but looks somewhat desperate, confused, and exhausted. Exam reveals accessory muscle use, grunting expirations, poor air movement, and cool clammy skin. The patient speaks in two-word phrases. Attempts to improve the situation are made with Lasix, nebulizers, and non-invasive ventilatory support. The patient cannot tolerate BiPAP due to anxiety. On a high-flow NRBM, the O2 sat is noted to be 89%. Review of old records reveals a baseline sat of 91% when on 4 liters by nasal cannula. The patient is found to have a favorable airway for direct laryngoscopy from an anatomical standpoint. However, he cannot tolerate laying flat for more than a few seconds. A decision is made to perform intubation by direct laryngoscopy under RSI. 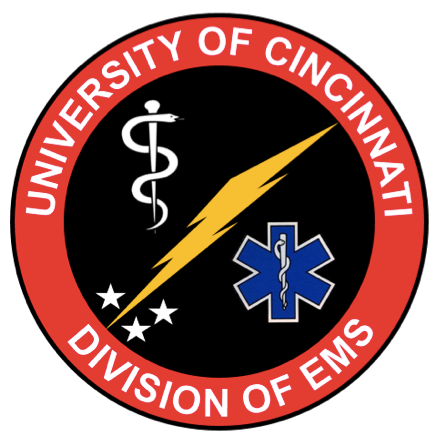 Prior to induction, the patient has a BVM connected to high-flow O2 placed over his face with a good mask seal, and is allowed to continue tidal breathing in an effort to improve pre-oxygenation. 1) What happens when a BVM is substituted for a NRBM, without squeezing the bag? 2) Should they be squeezing the bag to assist respirations? 3) Why is it a cruel lie to call a reservoir mask a “100% NRBM”? Not all bags are created equal. When a bag is substituted for a NRBM, one of two things must happen: 1) the FiO2 goes up, or 2) the FiO2 goes down. It cannot remain the same. Whether the FiO2 improves or not when the patient is allowed to breathe tidally without assist depends entirely on the exhalation port on the bag. If the exhalation port is open, without a one-way valve, the FiO2 will fall. 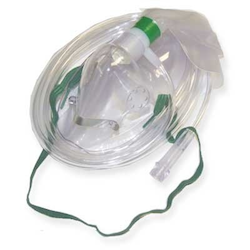 When the patient inhales, the negative pressure produced in the mask will draw gas both from the bag, but also from the room through the open port. This dilutes the pure oxygen reaching the mask, probably halving it, or worse. If the bag has a one-way valve, negative pressure within the mask closes the exhalation valve, and pure oxygen is delivered from the bag without dilution. The FiO2 will be higher than that delivered by NRBM. 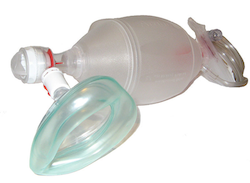 A bag without a valved exhalation port can be converted to a “good bag” by placving a PEEP valve on the exhalation port. Major bummer – You could smoke a stogie (bong?...this is a college, after all) through the exhalation port of the bags in the SRU…they do not have a one-way exhalation valve. The 100% NRBM should properly be called a “high-flow” NRBM. Look at the thing. It is full of holes. It never seals well on the face. It is held on by a single rubber band. The reservoir bag is often not inflated, or becomes twisted or kinked shut. While 100% O2 may flow into the mask, what flows into the patient is, optimistically, 75% . It is probably much lower than that unless the seal between the mask and face is optimized, and the reservoir bag is functioning as intended. The reservoir bag should inflate and deflate with respiration when it is doing its job. Whether or not this patient should be bagged is a surprisingly subtle question. We consider bagging when the saturation falls to 90% because this is the shoulder of the O2 desaturation curve. It takes longer to fall from a normal sat to 90% than it does to fall from 90% to venous sat. As such, when you hit 90% you are hitting the steep part of the roller-coaster, and trouble is seconds away. However, bagging is not free. There is nothing that seals the esophagus during bagging of the patient, and you can’t perform a Selleck on an awake person. Since all of our patients must be considered to have a full stomach, bagging raises the specter of a gas-distended, full stomach – not a good thing. This patient has a sat of 91% on his best day, so 89% is not as scary in him as it would be in you or me. However, he is still on the shoulder of that curve. He will desat just as quickly as anyone else, he just may tolerate hypoxia a little better – but maybe not. If tidal breathing through the mask doesn’t improve his sats, I would bag him. However, I would be very careful to coordinate that bagging to his respiratory efforts, to minimize excess positive pressure that might force gas into his stomach. By the way, bagging in the seated position is often more effective than in the supine position, especially in the obese patient or those with increased lung water. It’s just harder to do. Holding the mask with two-hand technique while facing the patient, as opposed to from the head of the bed, will be more effective in this situation.